Not to be confused with Liangfen or Nokdumuk. Grass jelly, or leaf jelly, is a jelly-like dessert eaten in Mainland China, Hong Kong, Macau, Southeast Asia and Taiwan. It is made using the Platostoma palustre plant (a member of the mint family) and has a mild, slightly bitter taste. It is served chilled, with other toppings such as fruit, or in bubble tea or other drinks. Outside of Asia, it is sold in Asian supermarkets. Grass jelly is made by boiling the aged and slightly oxidized stalks and leaves of Platostoma palustre (Mesona chinensis) with potassium carbonate for several hours with a little starch and then cooling the liquid to a jelly-like consistency. This jelly can be cut into cubes or other forms, and then mixed with syrup to produce a drink or dessert thought to have cooling (yin) properties, which makes it typically consumed during hot weather. 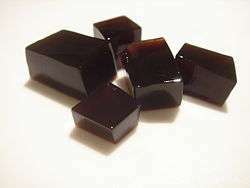 The jelly itself is fragrant, with a smoky undertone, and is a translucent dark brown, sometimes perceived to be black. Food coloring may sometimes be added to make it darker. In Mainland China, Hong Kong and Macau, grass jelly was traditionally served with sugar syrup. Now it is often served mixed with other ingredients, such as mango, sago, watermelon, cantaloupe, and other fresh or canned fruit, and evaporated milk. Although this dish is sometimes called liangfen (leung fan) in Chinese, it should not be confused with the Chinese starch jelly liangfen, which is an entirely different dish. In Indonesia, black jelly (Cincau hitam) is manufactured as an instant powder, like other instant jellies or agar. This form is easier to use. It is made from the leaves of Platostoma palustre (Mesona palustris). Two other plants used in Indonesia are Melastoma polyanthum, known as Cincau perdu, and Cyclea barbata, known as Cincau Hijau or green grass jelly. Plain grass jelly is mixed in various kinds of desserts, such as ais kacang and cendol. It is also mixed with cold soy milk and served as a refreshing drink/dessert, a drink known as Michael Jackson in South-East Asia (a reference to Michael Jackson's changing skin color and/or the song "Black or White"). Various combinations of grass jelly with rose flavoured syrup added to milk (bandung) are called "bandung cincau" or "bancau" for short. There is also shaved ice with grass jelly toppings. 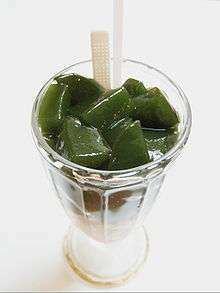 Grass jelly (Philippine: gulaman) bricks are used in the various Philippine refreshments or desserts such as sago’t gulaman, buko-pandan, agar flan or halo-halo. It may also be used in fruit salads. In Taiwan, grass jelly is known as 仙草 (xian cao), and is used in various desserts and drinks. It can sometimes be added to boba drinks and shaved ice (雪冰). It is also commonly used in a traditional Taiwanese drink, where the jelly is heated and melted to be consumed as a thick dessert beverage (仙草茶), with numerous toppings like tangyuan, taro balls, azuki beans, and tapioca. In Thailand, grass jelly is known as chaokuai (Thai: เฉาก๊วย, pronounced [t͡ɕʰǎw.kúa̯j]) like the Teochew, from Hokkien pronunciation of "草果" (cǎo guǒ in Mandarin). It is commonly served relatively plain together with ice and natural brown sugar. Additionally, it can also be served with fruits such as jackfruit, the fruit of the toddy palm or mixed with other Thai desserts. In Vietnamese, grass jelly is sương sáo or thạch sương sáo. Grass jelly is chopped in small cubes and served as an additional ingredient in sweet desserts made from various kinds of beans (chè). There are two common kinds of grass jelly in Vietnam which are Platostoma palustre (Mesona chinensis, called sương sáo in Vietnamese) and Tiliacora triandra (called sương sâm; sương sa or rau câu is the name for jelly made from various kinds of algae). Wikimedia Commons has media related to Grass jelly. 1 2 "仙草". 台北市內雙溪森林藥用植物園編輯組. "本品加水與少許鹹共同煎汁，添加少許澱粉漿可製成仙草凍，是夏天常吃的清涼飲品"
↑ Wei, Clarissa (2016-05-31). "Sweet, Black Grass Jelly Shouldn't Come Out of a Can". Retrieved 2016-10-11 – via munchies.vice.com. ↑ www.unimainz.de Archived December 18, 2014, at the Wayback Machine. ↑ TANAMAN OBAT INDONESIA. www.iptek.net.id. Retrieved on 2012-01-11. ↑ Kopi (Coffee). unclelimscafe.com. Retrieved on 2012-01-11.